Restaurant Seizan in Granview Hotel Ishigaki, is the right spot for an extensive lunch or dinner when you have enough time to relax and really enjoy the seasonal dishes. We went there for lunch to celebrate Manabu’s birthday. Seizan serves lunch and dinner. Dinner is a little bit pricier than average in Ishigaki. Lunch prices are on the other hand very reasonable. For less than ¥2500 we enjoyed a seasonal, high-quality lunch. With surprises along the way. Have you tried jellyfish before? Most of the restaurants in Ishigiki, Iriomote and the other Yaeyama islands have sunny beach style interiors. Reflecting the island vibe on the walls and on your plate. Lots of wood, shells, posters of fishes on the wall. However, inside Seizan, it’s more like a sudden teleportation to mainland Japan. This restaurant could be in Kyoto or Tokyo if the lovely woven ‘minsa’ on the wall here was replaced by a delicate ‘sumi-e’. The Yaeyama culture differs from the main islands of Japan. With its influences from surrounding countries and Ryukyu history, it’s an exploration of all your senses. But I love that minimalist, slightly formal, mysterious atmosphere from the Northern restaurants as well. Restaurant Seizan brought this from Japan to the Yaeyama, included the skilled sushi master from Chiba. 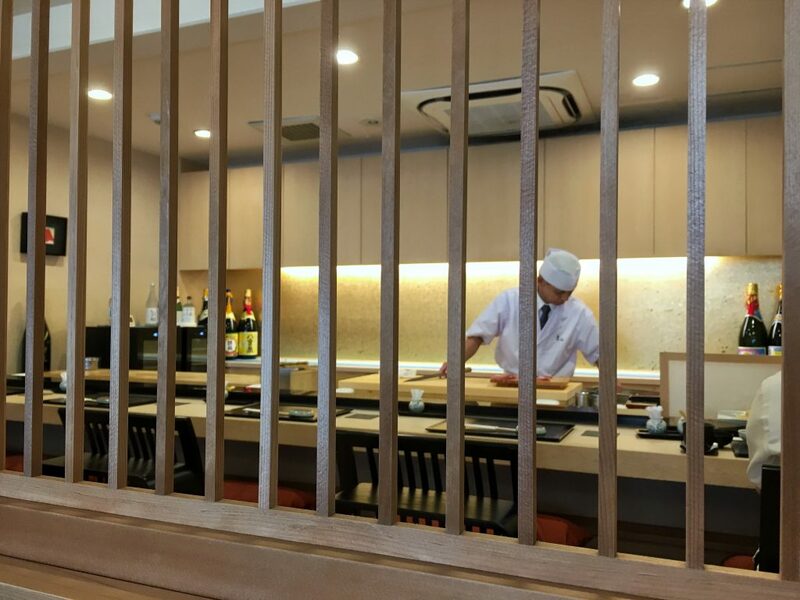 In Japanese restaurants, customer is still king. This creates a pleasant feeling if your travelling through this country. You feel welcome. In general staff is friendly and has a positive attitude. 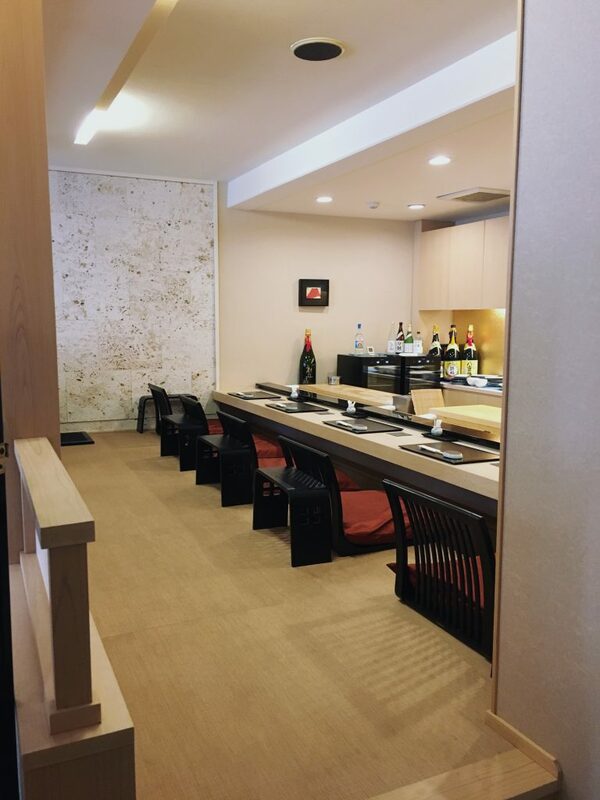 Here at Seizan you can choose to take a seat in front of the sushi chef and watch him preparing your dish. Fish is from local Yaeyama waters, veggies are seasonal, from all areas of Japan. Steamed egg custard. 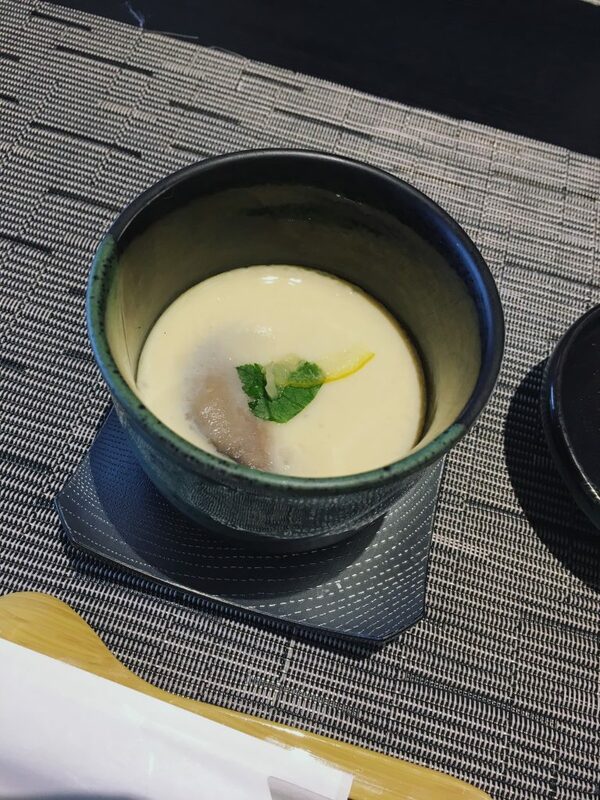 A traditional Japanese appetizer prepped with egg in dashi (a bouillon base which is widely used in Japanese dishes), shrimp, piece of chicken, mushroom and yuzu. A pink sakura bowl with two green veggies and a topping of ‘tonburi‘. Or ‘land caviar‘ which this delicacy is called in Japan. Tonburi are the seeds of Bassia Scoparia (hosagi). They are full of goodness, but can be toxic in high amounts. A blue bowl with cucumber salad and jellyfish in yuzu dressing. Say what? Yes, extremely interesting this tiny little dish. It’s mainly the texture that makes the jellyfish interesting here. The bite somewhat resembles raw octopus but softer. It doesn’t have a strong flavour, the jellyfish takes over the flavours of the other ingredients. A bowl of fresh lettuce and cocktail dressing. The brown bowl has a mini corn cob, okra, shiitake, daikon, steamed fish cake. On top a slice of carrot delicately carved into a sakura flower. Always with five petals, four is said to be an unlucky number. Mixed with a dressing of sticky potato starch. We aren’t used to eat so many sticky things, but for Japanese people it’s common. Sticky things are considered healthy here. I think it’s a matter of getting used to. Natto for example is one of these dishes foreigners always talk about. Most of them dislike it or laugh about it. It’s usually served at breakfast, as a topping over rice at lunch or dinner. These fermented soy beans smell like old cheese, has a slimy texture and if you have the courage to eat it you’ll notice the slimy texture can only be removed from your mouth after washing it with water. Japanese love it! And if they don’t like the flavour, they eat it because of its health benefits. A small dish with radish in ume (plum) dressing. And almond tofu. On the left raw tuna and cod sashimi on a bed of shiso and seaweed. Shiso is a vegetable which looks like a nettle, contains lots of vitamins and minerals and has an intense sweet-sour, fresh taste which works well with sashimi. On the right toro, the most desired part of the tuna belly. It’s the best part of the tuna and is for this reason a delicacy. Furthermore squid, salmon, shrimp, Japanese egg and sushi with tuna and ginger. 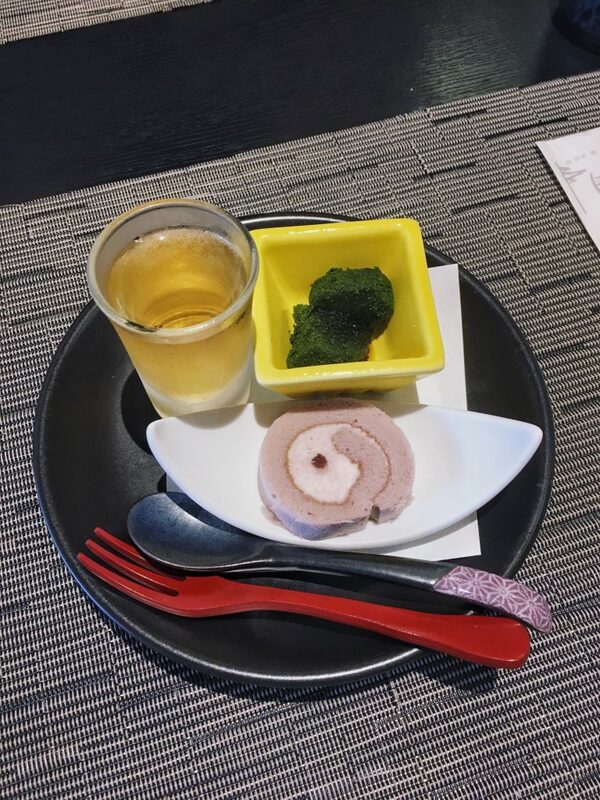 An apple vinegar jelly, matcha mochi and a cake roll with ume (plum). Served with care and attention. 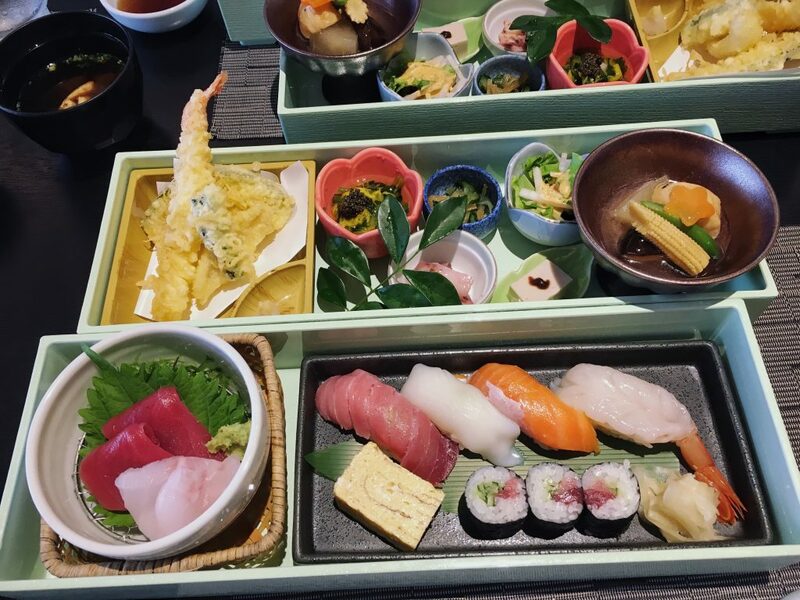 This lunch set is really the ‘taste of Japan’.